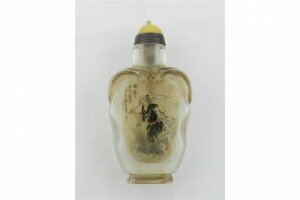 A Chinese moulded glass intaglio painted scent bottle, decorated with a child with his pigs and an immortal. 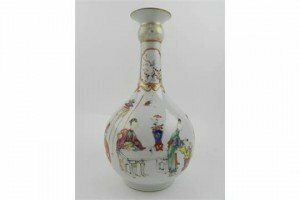 A Chinese 18th century Chien Lung period ovoid famille rose vase, with elongated neck and waisted flared rim, decorated all round with interior leisurely figural scenes. 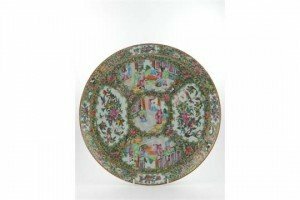 An unusual Chinese late 19th century famille rose medallion serving round tray dish charger, decorated with various panels of figural scenes in courtyard terraces and exotic birds and butterflies amongst flora and fauna. 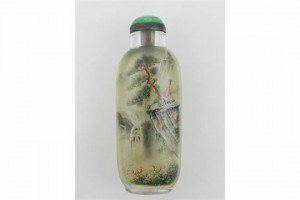 A Chinese glass scent bottle, intaglio painted with a mountainous landscape with figure in foreground, with verse to verso and cabochon stopper. 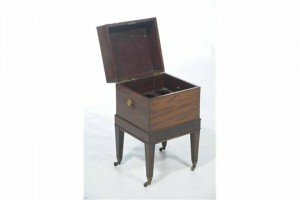 A George IV inlaid mahogany cellaret, the square hinged top with an ebony and line inlaid checkered border with satinwood fan shape angles with an inlaid frieze enclosing a fitted interior with two trays forming nine apertures for bottles, lions mask ring handles raised upon a plinth base, tapering legs, brass shoes and castors. 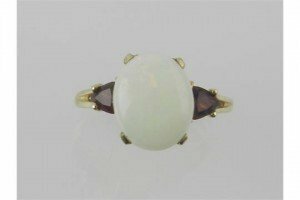 A yellow metal, opal and garnet ring, the oval cut opal flanked by two trillion cut garnets, the shank stamped 9K. 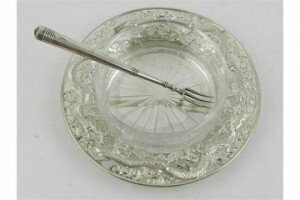 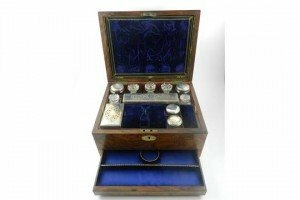 A Chinese early 20th century silver dragon decorated butter dish tray, with hallmarks, together with a three pronged fork. 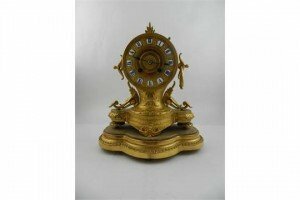 A 19th century French gilt spelter mantle clock, having eight day half cylinder movement, having ceramic Roman numeral plaque numbers. 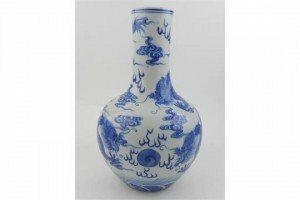 A Chinese 18th century style blue and white porcelain bottle vase, decorated with dragons and the Buddhistic pearl of wisdom above stylised waves, bears six character mark to base. 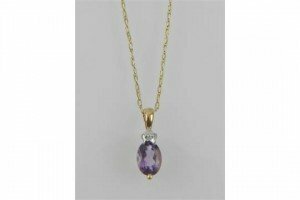 A yellow metal, diamond and amethyst set pendant, the suspension loop stamped 375, suspended on a fine yellow metal chain. 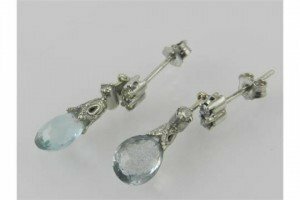 A pair of white metal, diamond and aquamarine drop earrings, each set with a briolette cut aquamarine suspended beneath three small diamonds, the butterflies stamped 750. 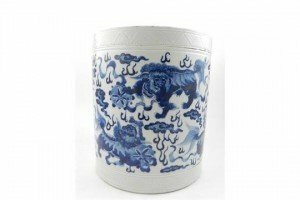 A Chinese blue and white hard paste porcelain jardiniere, decorated with geometric incised bands and in under-glazed cobalt blue with Shi-Shi and flaming pearls. 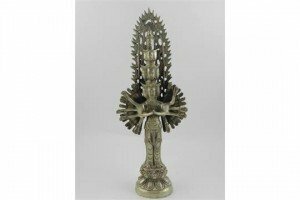 A cast white metal Buddhistic multi-limbed deity, with multiple graduating faces, raised on a circular spreading lotus base. 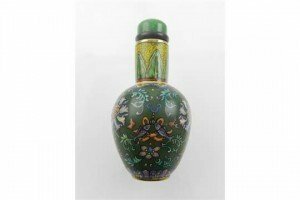 A Chinese brass scent bottle, polychrome decorated with palmettes and floral arabesques in enamels, with cabochon stopper. 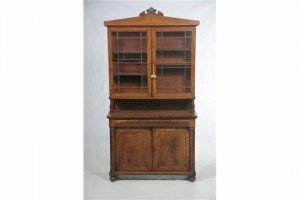 A William IV mahogany bookcase with a leafy cresting with an ionic pediment above a pair of glazed cabinet doors enclosing a divided interior with adjustable shelves supported on classical leafy columns, the lower part with a rectangular top above a concave drawer and two panelled cupboard doors with outset columns raised upon a plinth base and bun feet. 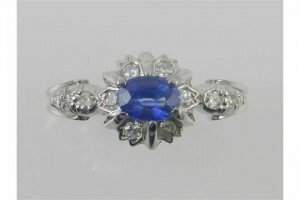 A white metal, diamond and sapphire cluster ring, set with an oval cut sapphire, the shoulders set with small diamonds. 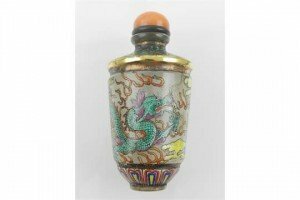 A Chinese glass scent bottle of cylindrical tapering form, polychrome decorated with a rain dragon and Buddhistic pearl of wisdom in enamels, with cabochon stopper. 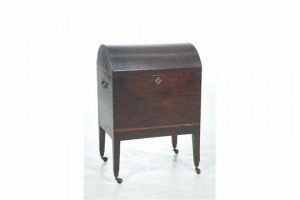 A George IV mahogany domed top cellaret, the hinged top enclosing a divided interior with twelve square apertures, brass swan neck carrying handles raised upon an inlaid plinth with tapering legs, brass shoes and castors. 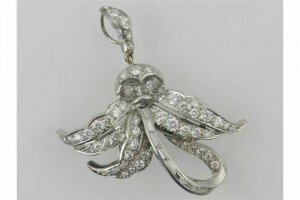 An unusual white metal and diamond set pendant in the Belle Epoque style, set with round cut and baguette cut diamonds.